The department maintains a Zeiss 510 confocal microscope originally acquired through the NIH/NCRR equipment grant program. Confocal microscopes eliminate much of the blurriness typical in widefield fluorescence imaging by removing light emitted from out-of-focus structures, producing a sharper image. 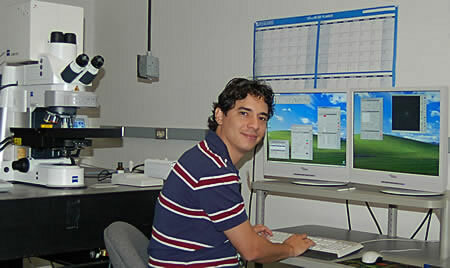 This page will serve as an internal resource for the users of the NBA confocal facility. I will start including useful reference material on this page and provide appropriate links that you might find useful. The Office of Informatics is presently working on establishing a Windows based login system that is presently the only limitation in beginning to use the instrument. We hope this will be completed soon. I or Rong-yu Liu will likely need to be available for the first time each user signs in to help insure that the proper configurations are established for that user account. This should only be a one-time issue unless an account becomes corrupted. We are establishing a web-based sign-up system that will be available to everyone in NBA. This will be the primary source for signing-up for the scope. Discussions are under way for appropriate limits on allocation. This is a work in progress and the policies will be instituted as needed, particularly if there are problems with access. One document of immediate utility is the quick start manual provided by Zeiss for the use of the LSM 510. The other document I’ve included is a primer on microscopy that any user would probably find useful. There are some excellent figures in this book that demonstrate some of the common mistakes made by novice (and experienced) microscopists. Rong-yu Liu (telephone x5556, Rong-Yu.Liu@uth.tmc.edu) will be responsible for the day-to-day operation of the microscope, bimonthly instrument tune-ups and user training. Neal Waxham (telephone x5621, M.N.Waxham@uth.tmc.edu) will be responsible for administrative and organizational issues and will serve as back-up should Rongyu be unavailable. As issues come-up please do not hesitate to contact one or both of us.